It is officially the first day of NaNoWriMo 2012!! A few of you might remember I attempted NaNoWriMo last year. I was not a winner–I reached somewhere between 20,000 and 30,000 words before quitting. For those of you who don’t know, NaNoWriMo stands for National Novel Writing Month. The goal is to churn out 50,000 words before the clock strikes midnight November 30th. Fortunately the goal is not quality. Only quantity. Which makes good practice for those of us who have a hard time moving on when our draft doesn’t sound quite right. And that’s the main reason I attempted last year–practice in imperfection. But this year my mindset is completely different! I finally believe in myself as a writer. I believe God wants me to publish books. So my goal this year is to have at least 50,000 words of a first draft by the end of November! Just as there was a difference between the first time I started training for a marathon (and didn’t follow through) and the second time (I reached my goal! ), there is a definite difference between how I started NaNoWriMo last year, and now. I even came up with a motivational tool: money in an envelope….enough to cover a Christian Writer’s Guild membership, a NaNoWriMo t-shirt, and a celebratory dinner. If I reach 50,000 words by the end of the month, I get my reward! If I don’t, my husband gets to blow the money. And yes, he did promise not to sabotage my goal! Wish me luck and hold me to it! And good luck, fellow NaNoWriMo’ers! When we first moved into our apartment, we figured it would be about a month before we moved the rest of our stuff over from storage. 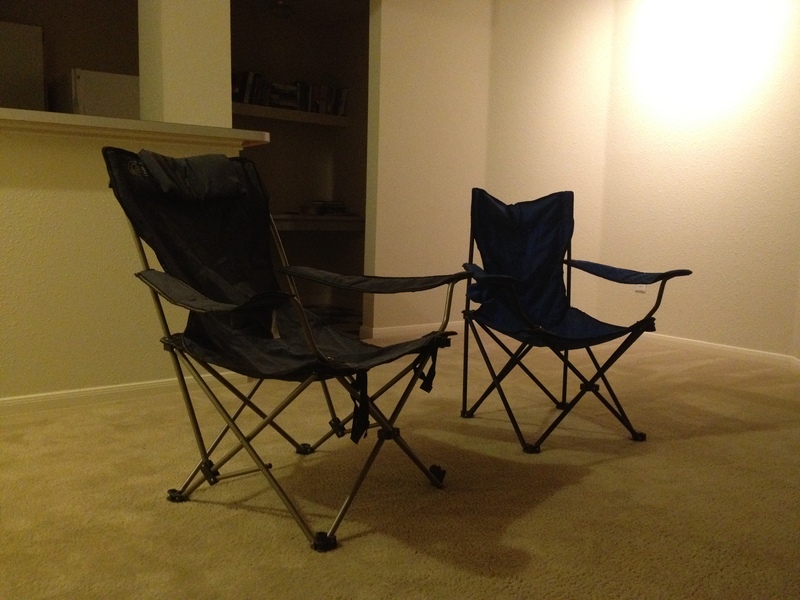 As I mentioned in a previous post, we’re using a couple camping chairs, sleeping bags, and a cooler as a coffee table. Unfortunately, we had to use the money we saved up, to pay for car repairs. Then, we received a “house-warming” monetary gift that would cover moving expenses–Thank you!! Time-wise, moving didn’t work for another month. We enjoy camping….but our backs are starting to complain after sleeping on the floor for two months. So we were really looking forward to getting our stuff this weekend or the next! But. It’s not going to happen. Something has blocked every effort we have made, every option we have considered. For some reason it feels like God doesn’t want us to get our stuff yet. It feels weird to write that thought out, for everyone to read. It doesn’t seem to make sense that God would care about post-poning our move date. But for some reason he does. There’s just no other way to explain it. I was disappointed at first. But realizing something about this has to do with God, makes me okay with it. 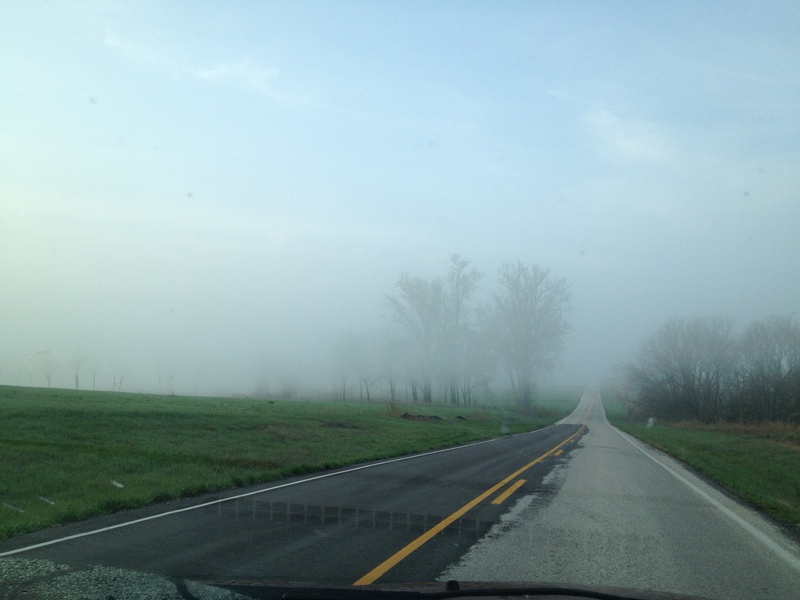 What do you do, or how do you feel when something seems unexplainably blocked in your life? I mentioned in an earlier post that I rediscovered my joy of writing fiction. I am more than ready to jump right in! I contacted my former writing accountability partner. We plan to hold each other accountable for our use of time, and any specific goals. I am so excited! Getting feedback from another writer can be a ton of fun. 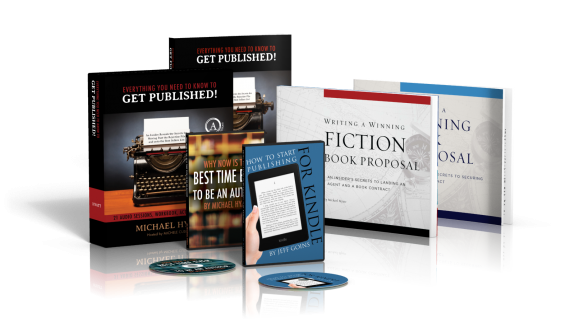 I purchased Michael Hyatt‘s Get Published. This is information I have always wanted to get my hands on! I have mentioned before that we are doing Dave Ramsey‘s baby steps, so this material was purchased with money made from selling our mower. Once I am done training for my marathon, I will use that time to write. Marathon training has definitely upped my self-discipline ability! 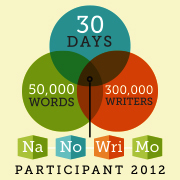 I plan to participate in NaNoWriMo. National Novel Writing Month promotes quantity–50,000 words to be exact–over quality. But it will enable me to get the gist of my story out. I can go back to tweak and research later. This is going to take a lot of self-discipline! But I figure, when’s a better time to start? Just this evening I told someone there are too many people who never pursue what they’re really passionate about…not enough time, not enough money, too many other things to do, or they spend too much time in front of the TV. If I have the chance to accomplish my dream, I’m going to go for it! Of course, I haven’t given myself a specific deadline to have the first draft done… Maybe it should be January 1, 2013, considering I will be participating in NaNoWriMo. What do you think? How have you used self-discipline to pursue your dreams, or to reach a goal? Yesterday we picked up the keys to our new home!! It is an apartment; not a house. But that doesn’t make it any less special. Family members have lovingly provided a roof over our heads the past seven months; now we have our own place! Getting an apartment, as opposed to a house, was slightly influenced by attending FPU. We want to be smart with our money. Even though we have enough money to get into the apartment, we don’t have enough yet to rent a U-Haul for all our stuff that is currently in storage. So, we’re going to temporarily make do. And fortunately for us, the couple that led our FPU small group is loaning us a set of pots and pans, and a few dishes. 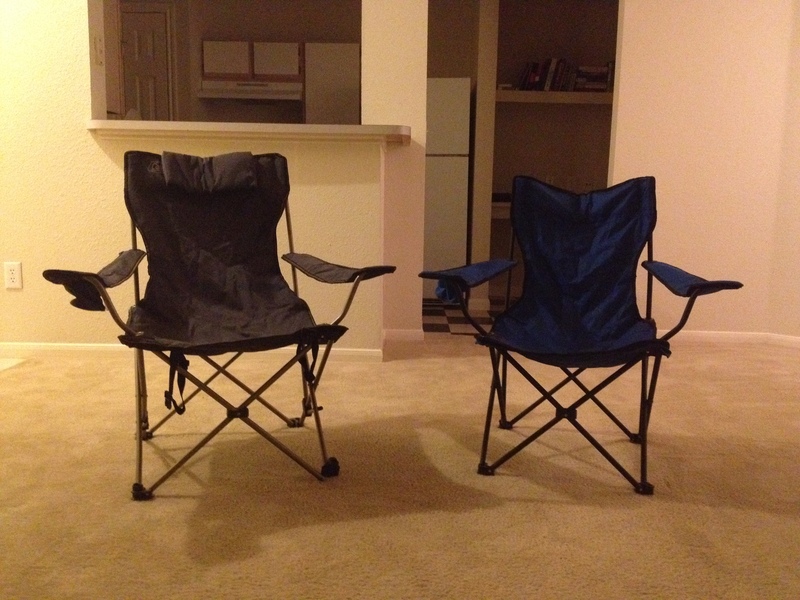 Otherwise, we have a couple camping chairs. And we’ll be sleeping on sleeping bags. I guess it’s a good thing we enjoy camping. And this has an upside–air conditioning and no bugs! 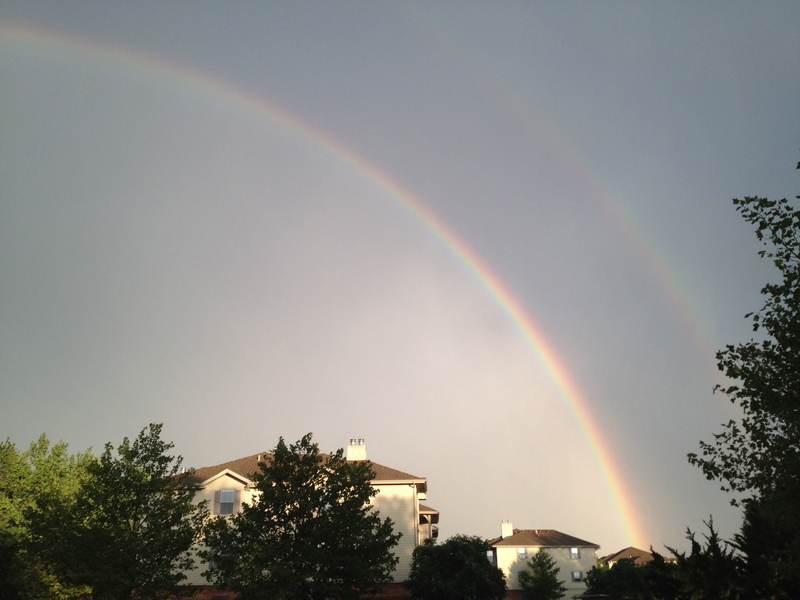 When we stepped outside our apartment, there was a gigantic double rainbow right overhead. It reminded us of God’s promises: God loves us, and will be with us. A rainbow is one of the only natural phenomenon mentioned in the Bible, that God used specifically to signify a covenant, and intended as a reminder in the future that he always keeps his promises. My steering wheel decided it didn’t like turning anymore, and instead of our planned celebratory evening, the evening was spent getting the car checked over. He could find nothing wrong, so sent me off. I went home and my husband took it for a drive. He discovered a few additional things not working: the power windows would only go up and down in park; not drive or reverse, the radio = no sound, shifting sometimes refused to happen (it’s not good doing 25 at 4,000 rpm). The next day my husband took it to a shop where one of the workers did not want to look at it because they thought it was possessed. The third day, the problem was finally figured out. And fortunately it was only one thing that needed replaced: the computer. When you only have one vehicle, zero extra money, and you’re supposed to be celebrating your marriage…. It can be a little stressful. Fortunately, I have the most wonderful husband in the world! Besides hugs and prayers, he made time for us to celebrate the day after our anniversary. 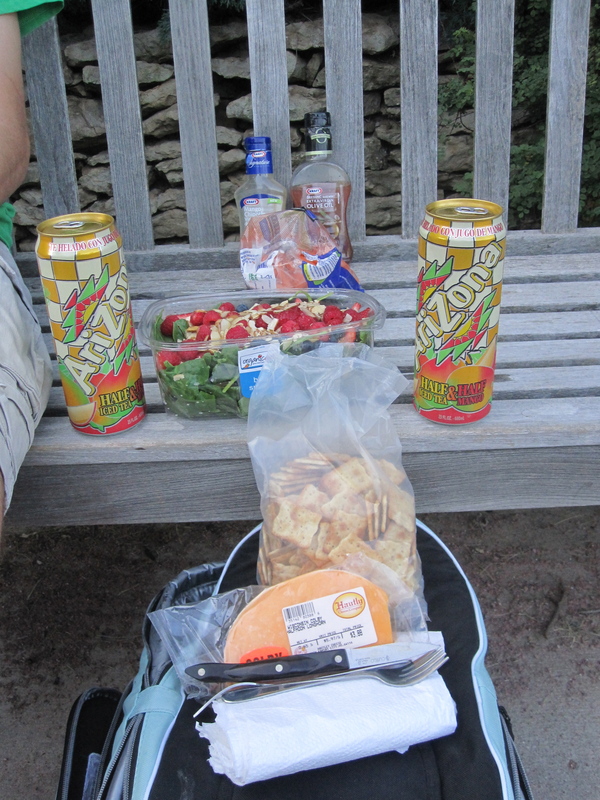 He took me out for a picnic at a gorgeous park. It was perfect! Can Stress and Communication Co-exist? I am stressed. Not as much now as I was earlier in the week. In The Beginning of Our Impossible Dreams, I mention a few situations that were stressful. And in Got Job? I mentioned part of the stressful process I went through in looking for a job. After God showed up at just the right moment in each of those instances, I declared I would never be worried about anything again! How naive! Faith is a good thing. And I should have it. But I was being naive about my humanness. I am prone to worry. And when I’m stressed, I need more communication to keep the stress level down. My husband and I learned that the hard way earlier this week. My stress level was increasing….where are we going to live? when are we going to make enough money to live on? (I wouldn’t be so stressed if this just affected us, but we’re depending on his mom’s good graces for our current housing.) My husband isn’t working a regular 9-5 job and I only had a partial idea of how he was using his time throughout the day. So the stress skewed my interpretation of his work. We had a miscommunication. I had a melt-down. We came back together and came up with our best solution: He would time-track his work in a little book. That way I could see what was going on–have a little security blanket. Much better than not communicating about it and better than me peppering him with twenty questions….or more. It’s funny. When I’m stressed I withdrawal. But when I’m stressed I need more communication. What a contradiction! Any tips from you about the best way to communicate during stressful times, or to deal with stress? We were walking through the clearance aisle. My husband picked up an item, “Oh! We should get this! We could use this…..” That’s about as far as I listened before coming up with a ton of reasons (in my head) not to buy the item. I interrupted, “I didn’t know you needed that. How long have you wanted it? How often will you use it? Where will we keep it? Where’s the money coming from? Is it worth it?” And as I’m asking all those questions I watch his face fall. I was one of those people who would go shopping for a specific thing, find what would work, and make an excuse not to buy it. I would go back to the same item three different outings and rehash the processes. And when I finally convinced myself to take the “risk” and buy, the store no longer sold it. My husband and I frequently interacted that way our first year of marriage. I was a tightfisted saver and my husband was an openhanded spender. 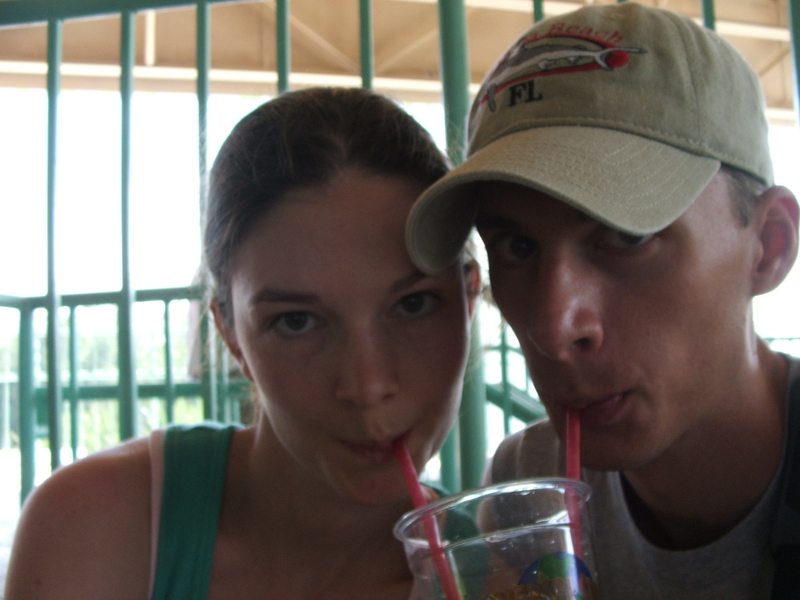 Our first year of marriage: Are we ever going to grow up!? Fortunately, we lived in a town of about 600 people. Consequently, less financial decisions to get into conflict over. We chose to look at our differences as an opportunity to grow. The tool that had the greatest impact on our growing together was a budget. I know, most people who have never lived by a budget go running, screaming from that word. But it’s true. Since I am the detail-oriented person, my husband let me create our budgeting chart, and he looked it over when I was done. It was easy enough to agree on where to allocate finances, but when it came to implementing our plan…. It was hard at first. But practice makes perfect. The budget convinced me visuals are valuable. Each time money was spent we could see how the numbers were affected. More than once my husband said, “I didn’t realize I was spending that much money!” More than once the numbers proved to me that yes, we could afford to have fun. Maybe even splurge a little. We meet more in the middle now on finances, but still retain our individuality. Now we view ourselves as a perfect match for balancing each other out. My husband is the idealist who sees endless possibilities, and I am the realist who asks the tough questions. We are both creative and use that to our advantage in coming up with solutions. I know every partnership is different. But when there is more than one person involved in finances it needs to be a partnership—a team effort—or nothing will be accomplished, other than a downward spiral. What are things you and your spouse do to grow together in the area of finances?